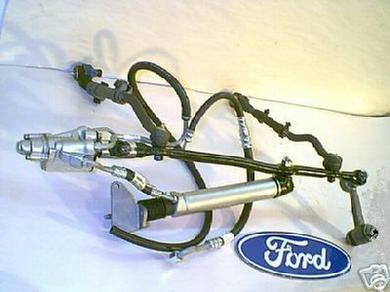 This is a Genuine 1965 1966 Mustang Power Steering Unit. Fits all V8 Mustangs (6 Cylinder Might be available-Call). Totally ready to install, Show ready. This is all the working pieces on the bottom end to install FACTORY POWER STEERING on your Classic. 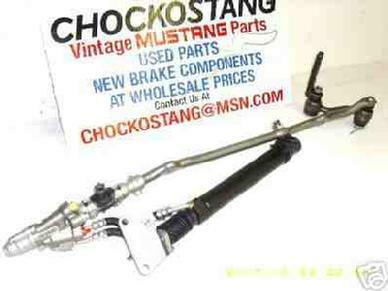 This is a Genuine 1967,1968,1969,1970 Mustang COUGAR Power Steering Unit. If you are installing on a 70, Please inform us as to this fact. We will make sure you get the 70 Center Link that is a bit different than the 67-69. Comes with ORIGINAL REBUILT BENDIX Control Valve, Brand New Cylinder, New Edelmann Hoses from cylinder to Control, New Idler, Original FoMoCo Center Link, and Original FORD Ram Mounting Bracket. This is a Genuine 1966 1967 1968 1969 FAIRLANE CYCLONE TORINO COMET Power Steering Unit. Fits All these as Factory..
Comes with ORIGINAL REBUILT BENDIX Control Valve, Brand New Cylinder (If you want a Bendix call), New Edelmann Hoses from cylinder to Control, New Idler, Original FoMoCo Center Link, and Original FORD Ram Mounting Bracket.